Sparkling Circles Video with Rina K.
Today is another fun day here on the blog because today, Rina K. has a new video for you! See how Rina creates these sparkling circles using Foil-Mates and some of her favorite foil! She uses the greetings from the All You Need is Love mini stamp set to complete the look. I hope you enjoy today’s inspiration and Happy Stamping! Lovely cards! I so enjoy her youth and enthusiasm, she is a “hoot”. Yes I enjoy die cutting things, but it can get tedious when doing multiples. But the end result is always so worth it. Hope your frustration with classes is soon behind you and you can relax. I don’t mind die cutting a few but I did buy a scan and cut for the bigger jobs!!! Awesome cards. Yes, I love to die cut! Cute cards. I do like the magic of die cutting, although it does get tedious when doing multiples of same die. But I really don’t like fussy cutting, so die cuts for the win! Love the cards Rina! The only time I don’t like die-cutting is when I am mass producing something, i.e.. Christmas cards. However, I would take die-cutting over fussy cutting anyday! I love die cutting. So cool to match up the dies with the stamps. Really enjoyed your video and really liked the cards. This is my first time to watch you! Will be looking for more of your videos. And I’m with you on the die cutting. I do not like it, but I do it often. I also like the looks of die cutting just wish I had a die cutting helper! So much stuff to work with and put up when die cutting. Gorgeous cards and love all the shimmer and shine! Rina thanks for sharing another awesome video do look forward to seeing more soon. Yes, I do love to die cutting cause it makes it much easier to cut something out, for me not great cutting things by hand. Thanks for sharing and see you soon once again, got to love all Gina K Designs products. Yes I like die cutting, it sure beats fussy cutting and alway make a project look so perfect…and I think you card was very cute and different from anything I’ve ever seen before. Thanks for sharing. I received a Big Shot Express for Christmas 2018 (thank you, hubby). Die cutting is easy peasy but still can be tedious cutting all those circles! I love the simple beauty of these cards — the foiled “sparkle” is amazing. I DO love to die cut. Your mom was one of my first card-making inspirations and the reason I purchased my well-loved Cuttlebug, which is stilll chugging along. 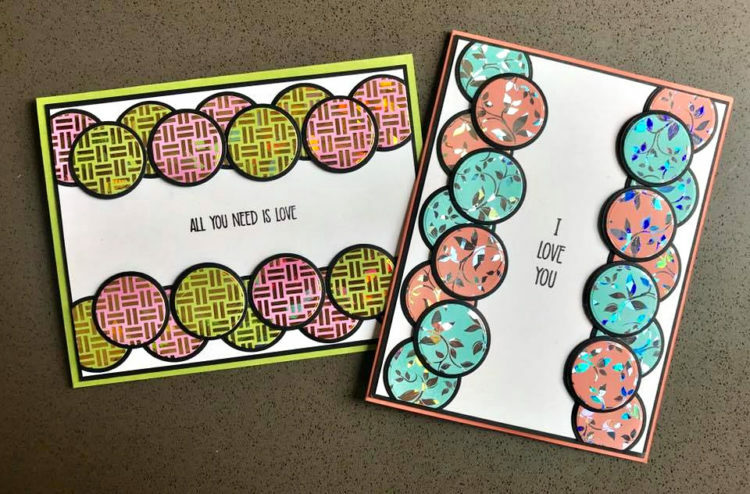 Yes, I like the creativity of die cutting – until my shoulder hurts! Like the cards! I love to die cut. Thank you for sharing your awesome talents and showing us the foiled cards. Love the way you kept the design simple. Yes, I do love die cutting. I make very few cards without a diecut. You are a piece of work! So surprise everyone and do an April fools prank of April 15th or the 30th. Yes I do enjoy die cutting and I use the Gemini machine from Crafters Companion so you will not have sore shoulders. 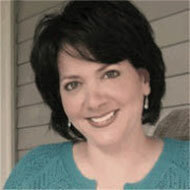 Hi Rina….love your video ….made me laugh in couple places. That thermoweb foil is amazing! Yes I love to die cut! Thanks for sharing your video and the thermoweb technique as well as the laughs. Have a great week and good luck with your school work girl! Yes, I like to die cut. I loved your cards. I haven’t used any of my foiling products as yet but plan to soon. Love die cutting! My friend and I make cards together and I would say every card we make has a die cut of some sort or shape! She introduced me to Gina K designs! You guys are greatest with your products and ideas. Don’t mind die cutting. Super excited to use my new electric machine! Great video & great card! I do like to die cut, in fact I really have to think hard about purchasing a stamp set that does not have a matching die set. Thanks for taking the time to entertain & educate us this week! I love to die cut! It is so much fun to make layered die cut cards. Keep up the great videos. Enjoyed meeting you at Simon Says Create this year! Yes, I love to die cut, even though it can be time consuming. I like to die cut. It always makes the cake more exciting to look at. I like to die cut. It always makes the card more exciting to look at. Love the foiled cards. Diecuts add a lot to a card… However if I have to do multiple diecuts it does get a little boring. Beautiful cards! Not a huge fan either of die cutting. Sort of a necessary evil while card making though so I put up with it! Thanks for the tutorial!! I do love o die cut. Used to use a Crichton’s a lot but I am more into the dies now. I love what you did with the circles. Never would have thought to use them that way. I am not a fan of die-cutting. My cuttlebug’s handle doesn’t work so good so it is hard for me to die cut. Have to wait for extra money to buy a good die-cutting machine. Love your cards. Great cards Rina! I love die cutting. Awesome idea on how you used the foil. Thanks for sharing. I love to die cut and you are an inspiration, thank you for sharing your talents. Yes I enjoy die cutting. I keep it at a minimum for each card. I like the stamping process better. Your card is beautiful; I admire your stick-to-itiveness. Is that a word? I do like to die cut, although if I need a card in a hurry (like I forgot someone’s birthday was coming up), I often skip the die cutting! Really like your foiled card designs! Love The Cards….. And I Love Die Cutting Gonna Have To Try Thd Foil…..TFS. I don’t mind die cutting. Excited to get to use my new electric die cutting machine also. Yes I like to die cut. I love everything about card making 🥰. Your cards really turned out beautiful. 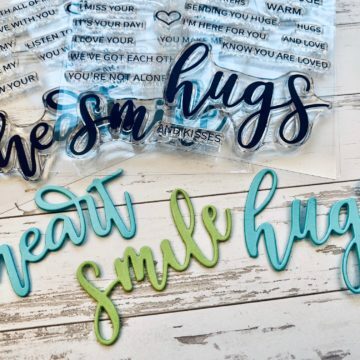 I love your videos & love die cutting! I have approx. 200 different dies LOL! Cute cards! Yes, I enjoy die cutting… might have preferred a punch for 18 little circles (no, I don’t have punches, I would die cut). Nice simple design card, Rina! Yes, I do enjoy die cutting! Almost as much as I enjoy watching your videos! I love the idea of die cutting, and the results of die cutting. I consider it a necessary evil of paper crafting. What a great idea! Your cards are really cute. I do love to die cut. Your cards are awesome. Oh and…….WHY DIDN”T YOU DO AN APRIL FOOLS JOKE? I enjoy die cutting because I love the perfect edges and the 3-D effectvut can give. Thanks for another great video. I love to die cut. Except when there are teeny tiny pieces that refuse to come out and I have to do it again and say bad words. I really like the results you get from Die-cuts. Everything is so dramatic with die-cutting. Your cards are sure shinny!! Whew! Loved them. I really enjoy die cutting because I like the precision that it gives. However, sometimes I don’t like the white area that it leaves on some dies. In the end, depending on what I am cutting, I will also fussy cut that white area off. Your cards came out beautiful. I love using die cutting on all my cards. I can’t help myself when I see a new die and absolutely want it. Beautiful cards! Love the colors and the sparkle. Yes, I like to die cut. Beautiful cards…nice work! I love to die cut as this allows me to make cards that really look professional, lol. So many die cuts out there that you can make almost anything you need for a card. Very beautiful and shiny cards, Rina. Love your bubbly and hilarious videos. Oh yes, I love to die cut. Its therapeutic to me. Your videos make crafting even more fun. My favorite part of cardmaking is die cutting! Going to see your mom and dad in Greensboro…can’t wait. Thanks for fun videos, Rina. I enjoyed your video with all the sparkling circles, so simple yet so pretty and very sparkly. Thanks Rina. Hope your shoulder is better. I do like to die cut however many times I cut by hand instead. Your sparkly cards are really beautiful! Beautiful cards, love the foil. I love to die cut , you can make such beautiful card with all the dies that are available. Beautiful cards Rina, I love to die cut not so good at fussy cutting. Thank you for adding the links directly for the products used. It makes it so much easier. Love your cards! I love to die cut when the pieces come out of the dies. Awesome cards! Yes I love to die cut. Fun card! I do like to die cut— it maybe in stages. Ha! Love the simple idea on your card. Shattered glass FTW! OMG! It’s flippin gorgeous! I love your sparkly cards! Right now I’m BIG into sparkle and glitz! I you just gave me another way of adding it to my cards. Die cutting is much more fun since I bought an electric die cutting machine. So YES, I love die cutting. IF YOU DON’T ENJOY DIE-CUTTING, THEN YOU MUST LIKE TO FUSSY CUT! WHAT A WASTE OF TIME! USE DIE CUTS!!! Both cards are definitely shiny – but I like the colors of the peach and aqua the best. Die Cutting – you bet. It really adds a special touch to any card. I especially like to die cut words several time and layer them for emphasis on my cards. Very pretty! I like to die cut, it is quicker than scissors for detail anyways. I like die cutting but maybe not that many. Cute cards—love the design. Very nice! 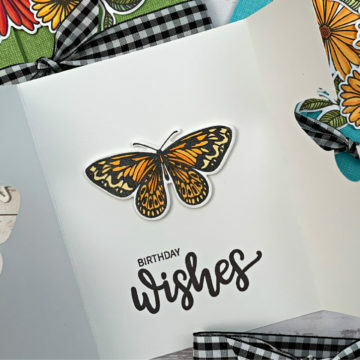 Die cutting is almost part of stamping! I would be lost without my die cutting machines (Gemini and big shot). I love die cutting because I can do so much more with card making. I love die cutting and particularly like using my Spellbinders Platinum 6. I enjoy watching your videos. Your fun approach is always inspiring. I am cheering you on in your studies. Stay focused!! Thanks for the fun tutorial!! I love to die cut, it gives the cards a very professional look and is easy to do. Really liked this card…and, I’m in your camp…die cutting is not my favorite crafting moment. Thank you for not April fooling that all those die cut circles were fun to die cut!!! I enjoy die cutting…..larger one time pieces…. I love Die Cutting they make beautiful cards, especially when layering. Your cards were beautiful I can’t wait to get some foil and try this card. Love both of these cards and will have to give it a try! I am a die cut junkie! Use them on almost every card or scrapbook page I do! Hang in there with school – junior year can be the toughest. My son graduates from the U on May 10th – we are all counting down after 4 tough years in Engineering! I do like to die cut, but not when there are too many pieces…then it gets a little tedious. I always enjoy the final outcome of die cutting, though I don’t think I would have the perseverance to do all you did for these pretty cards Rina! Rina, I loved your video! Your wit and humor made it a joy to watch. I do like to die cut. All of your hard work made beautiful cards! I can’t wait to make something like that! I love die cutting…nicely shaped ‘whatever’ die cuts we used…and generally a nice, equal margin around the outside. Rina you are a gem and a hoot! Kudo’s to your mama, she has raised you well and is a brave woman, I can only imagine your household while you were growing up!! I like die cutting….sometimes:-) The results are usually worth it but sure a pain in my backside and leaves my wondering while I do it…until the next time. I LOVE die cutting!! It makes one feel productive while watching a tv show!! 😀 I die cut all the time haha Loved your card!! I love die cutting. I use a Vagabond. Love the foil mates. Very creative way to use them. So yea, I like die cutting…I’m an old arthritic lady with an electric die cutting machine. It’s a no-brainer. Btw… love your cards! Love your videos! Hi There Rina, I love this card and I love die cutting. I sometimes find it tedious and time consuming, but I always like the end result. Thanks for sharing your talents with us. I love your sense of humor. Good luck with your classes! I am pulling for you! Very pretty! I do love die cutting and actually do it quite often. I love to die cut because it gives you so many options for making cards. Your youthful approach to card making is refreshing to see! Keep up the good work! I’m upset at no April Fools Day video-haha. Just kidding as a belated April Fools! I love to die cut but that’s a lot of circles…being on my Gemini and save my shoulder! Love the card, it is something different from the traditional flowers and whatever. Love to die cut on my small die cutting machine (except for the very intricate ones, I do it when I need to train my patience). Beautiful, shiny cards! I love die cutting. It is so nice to have a neat border around the image, rather than my fussy cutting, which usually is not so neat! I DO love to die cuts I flowers and shapes and butterflies! Great cards! I love to die cut for cards. Sometimes, I only have die cutting on my cards! Thank you for the great videos! Your cards turned out so cute!!! I do like to die. Yes, I love to die cut! I either use fun foam or layered for many of my cards. Really cool cards, thanks Rina, and yes I LOVE to die cut and then popping them up.